Here are two examples of Bolton’s work as a graphic artist. 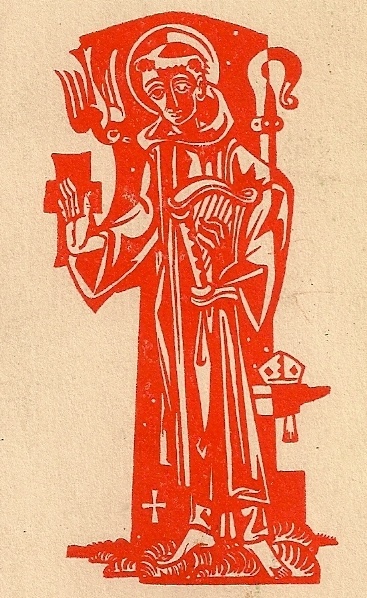 The first is an ordination card done in 1986 for a diaconal ordination. The second image is his own calling card from what he called St Dunstan Workshop – his studio at his family home in Villa Nova (as it was called in those days) – which he set up in the mid 1950’s as an attempt to get started as an independent artist and designer. The Workshop didn’t last long – Bolton had no mind for business. Both examples show his debt to the cubist movement, now reviled in traditionalist circles. He protested to me, however, that he was not influenced by it! Though the first image is merely in pen and ink, he loved wood-engraving and hoped to imitate it in this and other graphic images. The second is a wood-cut. So in contrast to the previous post, this shows again the breadth of his work. In the mid 1980’s an Episcopal parish called the George Washington Memorial Chapel within the confines of Valley Forge National Park requested designs from Bolton for a great rood and rood beam. It was an exciting prospect as his talents were not to be confined to the “modern” artwork called for by so many post-Vatican II clergy who most often called up him. Bolton understood deeply many, many genres of sacred art – not even confined to Christian art. This splendid, tiny neo-Gothic structure was designed by Zantzinger Borie and Medary, a superb Philadelphia firm that distinguished itself with remarkable church buildings, among others. The original design called for, but did not provide designs for, a rood beam to stand on large corbels projecting from the chancel arch high above the magnificent choir. Here is his drawing for the Beloved Disciple. His drawing for the full project is too large for me to scan, but I will attempt to photograph it at some point. Even here, the poor setup I have and the reflection from the glass prevent a better view of the image. Nonetheless, it shows his comfort with drawing in a late-medieval style. He joked about being a jack of all trades, but he was a master of many. I call this Great Hopes as like so many projects artists begin, it never came to fruition. The main donor died before it could be completed beyond the design stage. You are currently browsing the Bolton Morris Church Artist blog archives for February, 2010.